“Probably the biggest achievement of the St Albans St Cecilia Society is bringing together four distinct and different groups of amateur singers and musicians to produce an interesting and entertaining event. And this year the society’s concert at St Albans Cathedral presented those taking part with one of their toughest challenges to date. 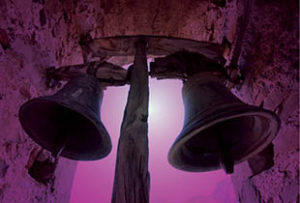 “For the central work of the evening was Rachmaninoff’s rarely heard setting of Edgar Allan Poe’s poem The Bells. From the performer’s point of view, Rachmaninoff’s music is almost always considered difficult and one of the reasons The Bells is rarely heard is because it is probably his most difficult work. “To get over some of the difficulties conductor John Gibbons prepared a completely new English edition of the work for Saturday’s performance. And the result was an excellent musical sound from the three choirs, the St Albans Chamber Choir, the Hardynge Choir and the Radlett Choral Society together with the St Albans Symphony Orchestra. “One major blow for the performance was that English trained Russian soprano Anna Gorbachyova, who had been due to sing one of the solo parts, was unable to attend because of visa problems. Her place was taken by Welsh soprano Eldrydd Cynan Jones, with tenor Geraint Todd and bass Jeremy White. While the musical sound was first class, the cathedral’s unique acoustic made it near impossible to hear the words not only in The Bells, but also the other choral works in the programme. “The evening had opened with a fine performance by the orchestra of Dmitri Shostakovich’s October, written in 1967 to mark the 20th anniversary of the Russian Revolution. Another rarely performed work, it relies heavily on the brass section of the orchestra. The resulting performance was first class.